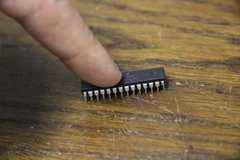 Yesterday, I read about the Touch�-sensor on Hackaday. The sensor is developed by the Disney Research Labs in Pittsburgh. It's a classifying touch sensor, which means that it can detect not only if you've touched it, but also in which way. The way they do this is sweeping the object with a frequency range, and looking at the various frequency responses this results in They then apply a SVM (a State Vector Machine, a kind of machine learning algorithm) to these measurements to classify the results. The Disney people actually published a nice research paper detailing in detail how they did it and what hardware and software they used for it. The paper actually is detailed enough for Hackaday to state someone would replicate the build within two weeks. I read it at the start of my free evening and I had nothing better to do... Challenge Accepted. I started by looking at the sensor the Disney guys used: they used a PCB with a 120MHz ARM CPU and a discrete AD-converter and waveform generator to do their measurements and a Bluetooth module to pass these measurements to the PC. I assume the PC then does the classification. I couldn't really build that kind of hardware in an evening: the chips are all at least TQFP, so even if I had them in stock, I'd need to develop a PCB or run tiny wires between the pins... so I decided to see if I could get away with some less powerful hardware. All the graphs in the paper seemed to indicate a sweep frequency of 0 to 3.5MHz... something that's not above the capabilities of an AVR. I might just get away by breadboarding one of those.